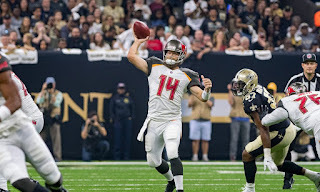 It goes without saying that we did not predict the Ryan Fitzpatrick led Tampa Bay Buccaneers would start 2-0. Actually, we predicted them to win just 3 games all year! I mean, come on, before the season started who saw them beating the New Orleans Saints on the road and then back that up by defeating the defending Super Bowl Champions! Tampa is one of seven remaining undefeated teams in the NFL. Richard and Kevin have shared their thoughts on which of the remaining teams will be the last undefeated team in the NFL. Right now, in my opinion, the Jaguars are the hardest team to take down. If there's one thing we needed reminding of this weekend, Blake Bortles is a dangerous quarterback if you give him too much time. This explains why we think of them as a "run first" offense because they play to that strength using the run. Believe it or not, the Buccaneers could very well be the last undefeated team (not counting the GB-MIN tie). Every so often you get an underdog team that starts running the table, get to 5-0 or something and then start complaining they aren't getting any respect. The Bucs right now are heading in that direction. Looking at the remaining teams, we can automatically cross the Dolphins and Broncos off. I wouldn't say they're flukey 2-0 teams, but they're just not that good. That leaves the Bengals, Jaguars, Chiefs, Buccaneers, and Rams. Four of those teams actually play three times within the next six weeks with the Chiefs hosting the Jaguars in Week 5, the Bengals hosting the Chiefs in Week 7, followed by the Bengals traveling to Tampa in Week 8. I like the Jaguars and - surprisingly - the Bucs to be the last perfect team standing. The Jags already won the hardest game on their schedule and if they can get past Kansas City in Week 5, they will skate until Week 8 when they host Philly. I think they're a good matchup for the Chiefs, as their strong defense should be able to slow down Andy Reid and the Mahomies, while Bortles takes advantage of a weak defense. Let's take a look at the next few weeks for each team to determine when that first loss can be expected. The next two weeks for the Rams are tough, despite both being home games. Week 3 brings the Chargers to the Coliseum in what we predicted to be the Super Bowl LIII matchup! Then, in a short week, the Minnesota Vikings head to Los Angeles for the first Thursday Night Football game on FOX this year. Both games can go either way. After what will be three straight home games, LA travels to Seattle, Denver and San Francisco. Ryan Fitzpatrick has been unbelievable in the first two weeks, filling in for the suspended Jameis Winston. There will be a serious discussion between the Bucs front office and coaching staff if he takes down the Pittsburgh Steelers in Week 3 on Monday Night Football. Should that happen, Tampa travels to Chicago to face Khalil Mack and that scary Bears defense before their bye week. Cincy travels to the NFC South for back-to-back road games against the Carolina Panthers and Atlanta Falcons. Joe Mixon's injury is going to prevent them from winning both of those games. However, in Week 5 we could have a 4-0 Miami Dolphins travel to Cincinnati to play a 4-0 Bengals team, but I bet both of those teams have a lose by then. We like the Dolphins to move to 3-0, beating the Raiders at home on Sunday. But it will end after that as they travel to New England to play the Patriots in Week 4. We broke down recent division history in the post on F6P. Miami is 2-4 vs Tom Brady over the last three years but did split the series last year. Kansas City hosts San Francisco on Sunday before heading to Denver to take on the Broncos on Monday Night Football. If the Chiefs can survive both weeks, it just gets even more difficult as they host the Jaguars and then travel to Foxborough to play the Patriots in Week 6 on Sunday Night Football. That Jags are almost sure to go 4-0 with the Titans and Jets heading to Jacksonville in the next two weeks. Come Week 5, we could have the 4-0 Jaguars travel to Kansas City to play the 4-0 Chiefs! In order for us to have the matchup desired above, the Broncos would have lost to the Jaguars in Week 4 after a tough matchup with the Ravens in Baltimore.